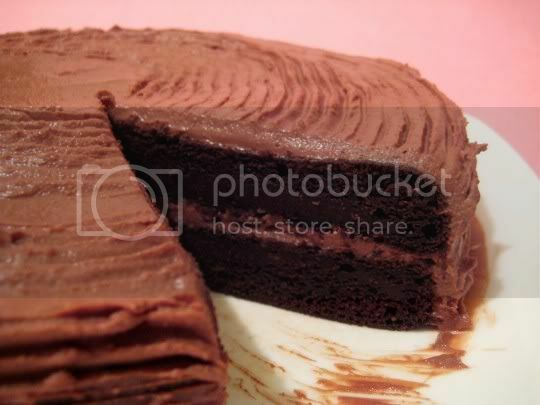 A purely vegan chocolate cake...that vegans will love, and all others may find to have an "interesting" flavor. The cake is completely egg- and dairy-free, but it's soooo moist and dense that it's almost hard to believe. What gives it this texture is pureed tofu and lots of liquid sweetener, courtesy of a whole cup of maple syrup, as well as coffee. Yes, coffee...which seems to really enhance the chocolate flavor. Making the cake was simple enough: your standard wet-to-dry ingredient mixture, although baking time was almost tripled from the suggested amount in the recipe. The frosting was simple enough to make as well: puree tofu (yes, more tofu), vanilla extract, and semisweet chocolate (by the way, the Ghiradelli brand is vegan), and you've got an easily spreadable, thick, rich frosting. Unfortunately, it's the frosting I had a problem with. While the cake is dense, rich, moist, and ultra chocolatey, the frosting has way too much of a soy-tofu flavor to fool anyone. It has an almost subtle bitterness to it, which isn't a good complement for an already semi-sweet cake. I'd even go so far as to say this would have been MUCH better with maybe a super sweet cream cheese frosting. Make again? Probably not (unless I try the cream cheese thing). I'm sure vegans would love this recipe, but for the rest of us, it's a one-time thing.